Relive the nostalgia of parades yesteryear - both real and fictional. These are great celebrations! "Jack Benny Show: Easter Stroll"
A parade is simply a group of people moving along a common route with other people watching them. As they become more organized, parades lend themselves to a wide variety of themes and traditions. Parades are an important part of annual holiday and civic celebrations and will require a great deal of support from the law enforcement community to not only help control the inevitable crowds but to direct the disruption in traffic. Some popular parades include Macy's Thanksgiving Day Parade in New York City featuring huge character balloons, the Tournament of Roses Parade in Pasadena, California, billed as part of America's New Year's Celebration, the "Show Us Your Shoes" Parade in Atlantic City where Miss America contestants display shoes themed for their home states while riding on the back of convertible automobiles along the Boardwalk just before the Pageant Finals, and the "Westward Ho!" Parade in Pendleton, Oregon, celebrating the Western origins of the Roundup by not allowing motor vehicles. One of the most popular parade features is parade floats. These fanciful creations got their name because they were highly decorated barges towed along canals by marchers. Some canal floats were propelled by oarsmen hidden within the structure of the float, but the flimsy construction of the float barges led to several drownings. Some of the earliest "grounded floats" were horse-drawn affairs used in ceremonies honoring the drowned oarsmen. In modern practice, floats are usually towed by motor vehicles or self-propelled with the driver in a hidden compartment. 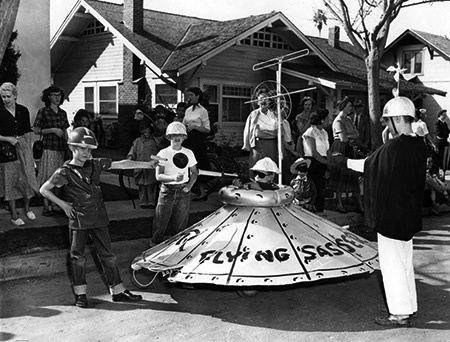 On The Alan Young Show, our hero is entrusted with the secret plans for the Van Nuys Rose Parade float, which is not certain to end well. The tradition of parades as civic celebrations has its origins in military marching drill. Drilling troops arose as armies began fighting as units rather than individuals. Tactically, formation fighting reached its apex during the Napoleonic Era but using such tightly grouped forces became suicidal with the development of breech loading rifles, artillery, and especially machine guns. Close-order formation marching is still an important part of military training because of the teamwork and discipline it instills, even though its use is largely ceremonial. A ceremonial military parade is the centerpiece of the fourteenth episode of Jerry At Fair Oaks. When Charles Lindberg returned to America after his historic transAtlantic flight aboard the USS Memphis, a parade was held from through Washington DC, and the Blue and Red Networks had reporters on hand to cover the whole thing. Jack Benny and Mary Livingstone were regular participants in the Easter Parade along Wilshire Blvd and in 1955 drives the Maxwell in the Pasadena's Rose Parade. 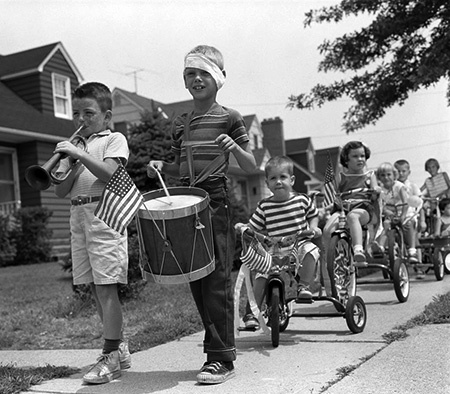 Bob and Ray covered several parades, including New York's fourth of July Parade, Boston's American Legion Parade, and the "February 8th Parade" from New Hampshire. After the Memorial Day Parade, our favorite water commissioner decides that it is time for him to draft a will, and he considers endowing the city with a statue of The Great Gildersleeve. Wistful Vista's leading citizens, Fibber McGee and Molly are called upon to lead the town parade, on horseback! This unlikely feat is more than matched by Charlie McCarthy's intention to lead the parade opening the New York World's Fair from the back of an elephant. Upset horses interfere with the parade opening the newest amusement park in Metropolis, Happyland, but the Man of Steel has reason to suspect foul play on The Adventures of Superman. A parade becomes an unlikely public relations tool when a genuine Martian hires a PR firm to publicize that the Martians are coming in "The Parade" on Dimension X and X Minus One. The Columbia Workshop presents some rather fanciful parades, including an imaginary one down a New York street in "And to Think I Saw It on Mulberry Street", and a heavily allegorical anti-war story from the streets of New York where "The Parade" can neither be seen or heard. 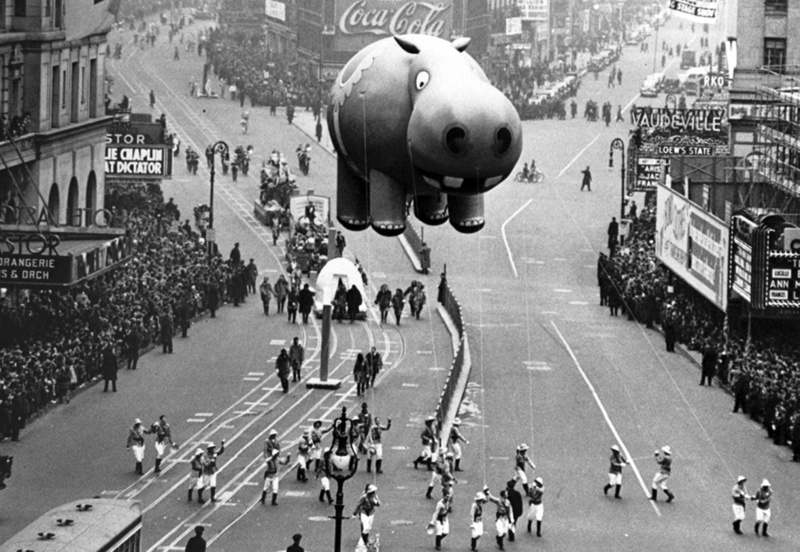 Perhaps the most imaginative parade in radio was the Christmas Parade on the 24th (of 26) episode of The Cinnamon Bear. I was immediately delighted remembering the X MINUS ONE broadcast of "The Parade" in your sci fi collection! Ah, I thought they were broadcasts of past parades....still interesting.